95 records – page 1 of 5. Point of connection, Grand Trunk Pacific Telegraph Lines, Fort Fraser, B.C. On the back of P0251a is written: Erection of last telegraph pole between [?] and Prince Rupert in 1914 at Fort Fraser, B.C. 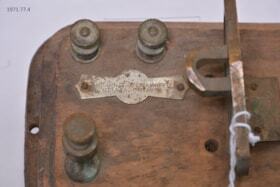 The telegraph relay has two metal round flat legs with holes drilled in the middle. The body is wood. 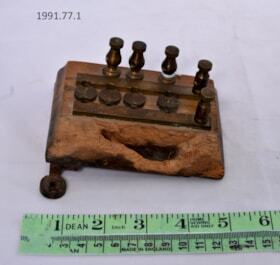 Situated on top of the wood are five screw like objects with flat serrated heads. Three of those have round bodies; two have square bodies. There are two lone rectangular metal pieces with four curves cut in each. In the middle of those, are four round metal pieces with curves cut on each side. One has a screw hole cut in the middle. The Telegraph line was activated in 1901 from business centres in the United States and the Southern part of the British Columbian, all the way to the Yukon gold fields. The telegraph line was completed in 1901 and ran north to Telegraph Creek on the Stikine River, onto Atlin, White Horse and Dawson City. 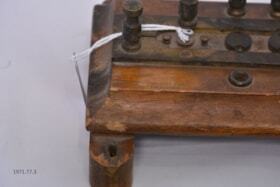 The telegraph has two long legs that hold the body 2.1 cm long with only one screw in one of the legs. 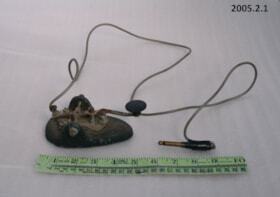 The body of the object is 15.8cm long. The top of the object has 5 Cylinders; one is missing a round with grooved sides top. In the middle are two pieces of metal that are cut in the center so that three screws can be placed. There are holes on either sides of the screw. Beside the screws is a circular metal piece (2.5cm long) that has a neck (1cm long) to connect to a smaller circular metal piece ( 1.5cm long). There are some numbers and letter subscribed in the wood but they are too faded to read. On top are two little holes that have been filled with plastic. Heritage Club Project, October 1, 1973 B.V. Stories, Smithers, B.C., See-Moore Printing. The telegraph has two long (12.2cm) legs that lift the object 2cm high. The top is grooved on all four sides. On the top of the flat surface there are five cylinder like objects on top. One cylinder is not fully screwed down. There are two holes with plastic fillers to protect the inside. The middle has three bigger flat with grooves on each side of the screws. There are two flat pieces of metal protecting the screws. There is writing in the wood but it is to difficult to see. Heritage Club Project, October 1, 1973 B.V. Stories, Smithers, B.C. See-Moore Printing. Heritage Club Project, October 1, 1973 B.V. Stories, Smithers B.C., See-Moore Printing. 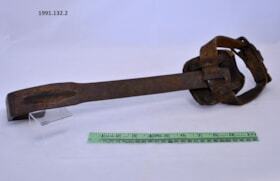 Oval shaped frame with rusted metal bars and a gray cord with wires exposed on each end. Black paint is chipping off from the frame, exposing the cracked metal undernearth. 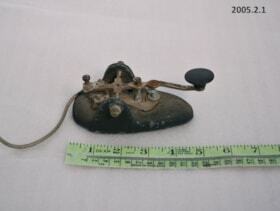 A telegraph key with a small, oval, brass base and brass fittings. 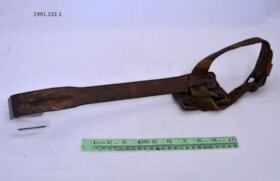 The lever key is steel with a black, flat, round knob. 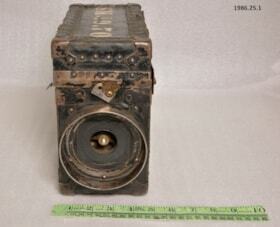 There is another black knob next to it, attached to a brass lever. The base is marked at the front top 'J.H. BUNNEL & CO., NEW YORK, U.S.A.'. There are three screw holes in the base. 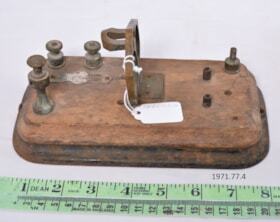 An 'automatic' telegraph key with a heavy, rectangular, metal base. 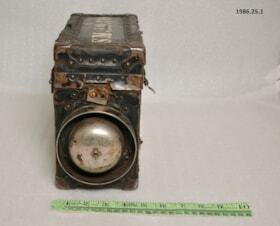 The bottom of the base has tripod, stubby feet and two narrow copper strips attached with screws to fittings at the top. JEP is inscribed on the side of the platform. The lever key and fittings on the top are silver-colored metal. 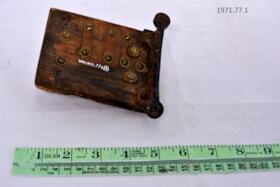 The key has a black, round, flat knob at one side, the end is a black, triangular piece on the other side. Below and to the side of this is a small lever (on/off switch?) with a cylindrical, red knob at the top. The key, which runs the length of the base is attached to a square metal holder near the font of the base. This square piece has "78" stamped at the bottom center. The key is attached to it with several different fittings. At one side is a short (approx. 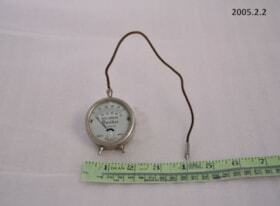 60cm) length of tan, cloth-wrapped wire. The wire has a black, cylindrical grip and a pointed copper plug at one end. The other end is divided into three wires which are connected to fittings on the base. From previous card 'Used on the Old Telegraph line at Telegraph Creek', during 1919 - 1954, by Joe Panter. -called a 'Telegraph Bug'. Hand-held Volt-Ammeter that measures volts and amps. Attached is a leather cord. Some scratches on the glass. 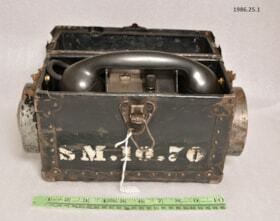 The telephone is inside of the Black box possibly from G.T.P. SM. 10.70 engraved on both sides and top of box. 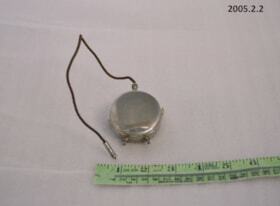 Hinge lid (attached). Inside: Black phone with attached cord. Bells attached on both sides of the box. On one side the bell is missing. 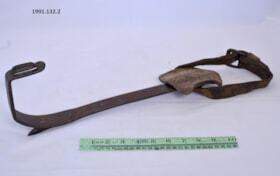 A spur consisting of a long, flat iron brace which is 38 cm long and ends in a U-shaped bottom. At the top of the brace a thick leather strap runs through a metal loop and is closed by a buckle. On the strap is small square pad with a felt backing and two leather loops which are riveted to the front. There is a metal loop on the one side of the U-shaped bottom and a sharp metal point on the other side. Series pertains to the Department of Public Works overseeing of telegraph services in the Bulkley Valley area, including the Yukon Telegraph Line. Records include inventories, requisitions and work reports. Series includes inventories, requisitions and work reports written by Charles P Janze, John Jensen and William Blackstock. As a result of the Klondike Gold Rush, the Yukon Telegraph Line was established to link the rest of Canada with the Yukon. The Line was an overland telegraph operated by the Dominion Government of Canada from 1901 and 1936. Telegraph service previously existed up to Hazelton with the Collin’s Overland Telegraph (1866), which was built by the Western Union Telegraph in hopes of linking Europe and Canada via the Bering Strait and Russia. 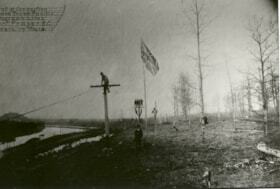 However, with the Transatlantic Telegraph Line was completed first, construction on the Collin’s Overland Telegraph was halted just north of Hazelton. In 1899 or 1900, the Dominion Government of Canada began construction north of Hazelton (which at the time was undeveloped and remote), using a combination of old Collin’s Overland Telegraph surveys, First Nations trails and the Ashcroft Trail. In 1901 the telegraph began operation, employing one lineman and one operator at each station cabin along the route. There were nine main cabins along the route numbered 1 to 9. Beyond the Ninth Cabin, the stations were named based on nearby geographical features, such as Echo Lake or Iskut River. In between each “home stations” were refuge cabins, referred to by distance from the main cabins in the reports by linemen. Most of the records held by the Archives pertain to the Eighth Cabin, of which Charles Philip Janze maintained the northern lines and John Jensen serviced the southern portions of telegraph line. William Blackstock most likely maintained the Ninth Cabin and its surrounding lines. 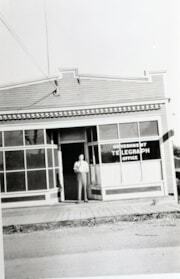 Unfortunately, in 1936, substantial flooding severely damaged sections of the telegraph line and supporting infrastructure, and with the emergence of new wireless radio technology, the Dominion Government could not justify spending the money for repairs and the Yukon Telegraph Line was permanently shut down. 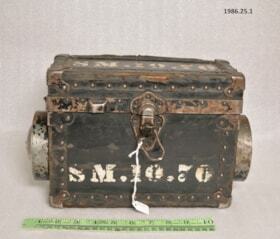 Item is a newsletter produced by the students of the Smithers High School for December 1939. Title based on title of item. 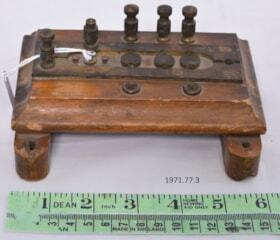 The Moccasin Telegraph was produced every two months. Item is a newsletter produced by the students of the Smithers High School for December 1940. Information on photograph written on the back of the photograph. Government Telegraph office with man in front.